Tonya has been working as a legal assistant since 2004. She joined Duggan & Hughes in 2016 after working at other law firms in the area of Social Security Disability. Tonya primarily assists with handling Social Security Disability Claims. She is well trained and experienced with assisting clients of Duggan & Hughes with their Social Security Disability claims. Tilda has been working as a legal assistant since 1992. She joined Duggan & Hughes in 2016 after previously working with John Duggan and Daniel Hughes at another law firm for several years. Tilda brings a great wealth of experience with assisting clients of Duggan & Hughes in a variety of areas, including personal injury, general litigation, estate planning, probate, corporate, and social security. Susan has been a paralegal since 1997. She has been working with John Duggan for 18 years and with Daniel Hughes for the 12 years. 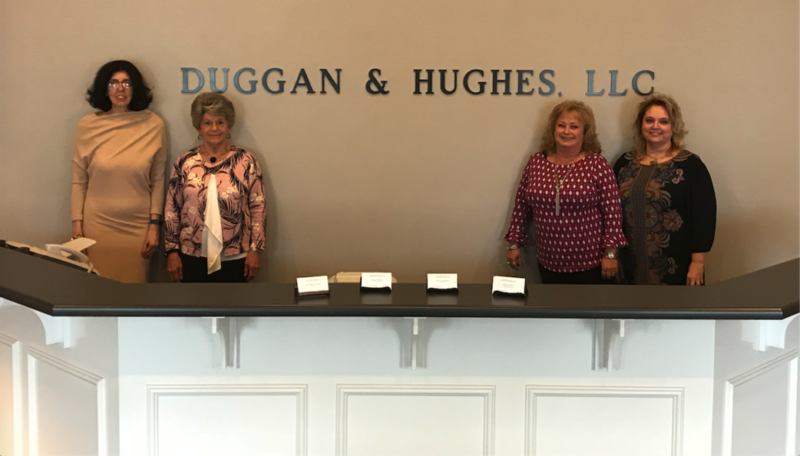 Susan brings a great wealth of experience with assisting clients of Duggan & Hughes in a variety of areas, including personal injury, workers compensation, and general litigation. Susan also handles all of the paralegal work for city court prosecution in the Cities of Greer, Mauldin, and Travelers Rest. Jan is the firm’s bookkeeper and has worked as a bookkeeper for 45 years. Jan’s experience in this role is tremendous asset to the management of Duggan & Hughes.